We couldn't be more excited to share this engagement story with all of you! We may be a little bias because it was for our cousin/niece, but also because it made our nautical hearts so happy. A few weeks ago I received a phone call from my cousins (then) boyfriend. I have been waiting for this call for months now, so I was hoping I knew what he was going to say...and he said it! He asked if we could help plan the perfect engagement for him and my cousin, Meghan. It worked out perfectly because we always go to Bethany Beach for easter. This wouldn't be anything out of the ordinary, and we could give her the nautical proposal of her dreams...or so I was hoping. As I thought of ideas, several of them wouldn't work because of timing. It needed to be something that she wouldn't suspect, so it couldn't be at night, unfortunately because those lanterns would have been amazing, and it couldn't be in the morning because we always went to an egg hunt at the community hall after breakfast. Once that ended, we typically have a picnic at Assateague Island, where we also have our own egg hunt. This was the perfect time to "forget the eggs". I had planned to say we would run home to get them, and just have the egg hunt on the beach. But then what would it be like on the beach? Even more ideas were running through my mind, a proposal with rose petals spelling the big question, a romantic set-up for the two of them, and other various ideas. While these would have been nice, family means so much to all of us, so I wanted to include everyone if I could. This is where the brainstorming came into play. I talked with Larry about a few things, and then we decided on a few people holding signs that said "Will You Marry Me?" This worked out really well because Larry has two children and they were able to have a part of it. I also wanted to include a styled set-up for them to take some photos with after Meghan said "YES!" I had Dave (my husband) set-up to take photos, my videocamera going to catch everything, and the perfect location on the beach. It turned out perfectly! One thing we didn't count for is the freezing temperatures and the high winds, which made some of the photos more difficult to get when fingers are red but it was still beautiful. While the adults were "hiding" the eggs, Meghan stayed with the kids until Larry came to get them to begin the egg hunt. That was his children's hint to run as fast as possible to hold their sign. Then Meghan and Larry came around the corner. As they walked towards the signs, Larry began telling Meghan all the wonderful reasons they should be together, and how she is the best gal he could find. It was absolutely beautiful. When Larry got down on one knee, Meghan said a tearful yes. Once the question was popped, the children turned over their sign and it read "Will You Marry Us?" They were able to get some adorable photos afterwards, and it all turned out so well! 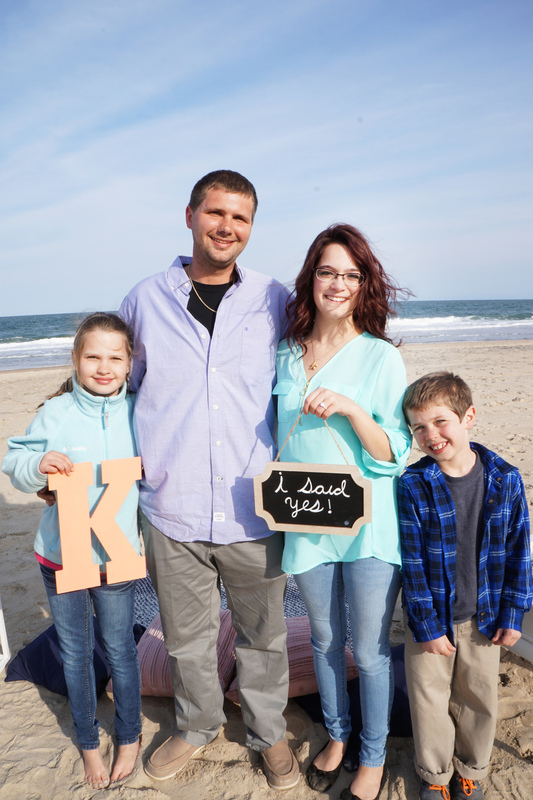 We are so excited for the two of them and can't wait to get to planning their big day!